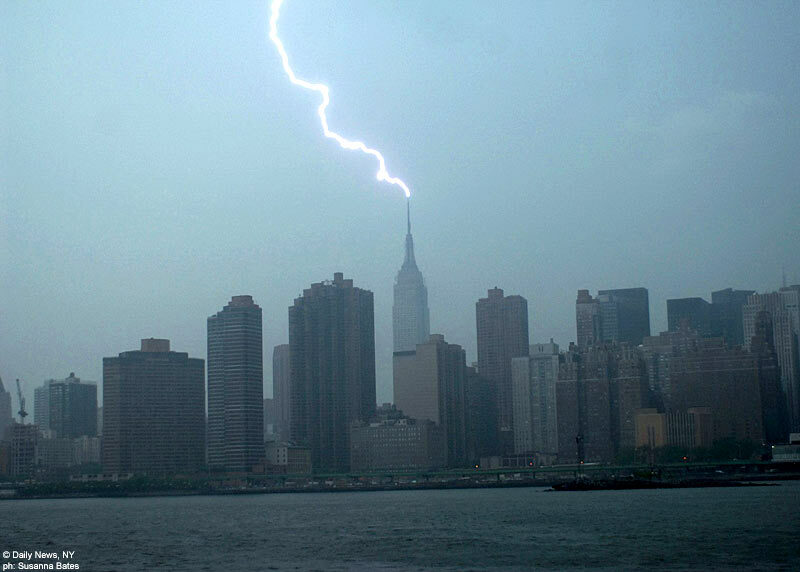 Like a molten thread of white heat, lightning cuts across the grey skies above midtown Manhattan to find the top of the Empire State Building. The storm yesterday afternoon was part of the latest blast of bad weather to hit New York. There was no damage to the 1,454ft Empire State Building. The lightning rod at its very top absorbs such strikes around 100 times a year. It may not, however, have been such a good day to visit the outdoor viewing gallery on the 86th floor. That is so cool, although I wouldn't want to be up there during a storm. Hahaha Your welcome. Its truly a spectacular photo. That's is very amazing! That person was lucky to be there to see it at that exact moment to take that picture. Thanks for posting this, Prada! yup those days were nasty...my company's building (50 floors) kept creaking. What a photo!It's really spectacular! That is one amazing picture. Wow! Really spectacular picture, thanks Prada. Definitely would not like to have been on 86th floor when that hit! Wow thank you so much that photo is amazing! The person who took it must be v.lucky Imagine if you were up when it hit (I'm sure they probably clear the outdoor bit?) but flipping heck that would make you jump.